Sunday I participated in a beach cleanup organized by Living Oceans and my host, Kerri, then started preparing my dye baths and fabric. This process is time consuming, and I'm not even taking the amount of time I could to prepare my fabric with mordants such as soy milk (which is a multi-day process in itself). It will take me about 4 days before I'm ready to even start dyeing my fabric or thread. I brought with me many different types of materials to dye in many different ways. I'm curious to try eco-dyeing bundles, solar dyeing, and more traditional dyeing processes. What the cottage kitchen has looked like all week. I brought three different kinds of thread to try embroidering with: 100% silk, 50/50 silk/merino wool blend, and a silk/linen blend. They're from the Silk Weaving Studio on Granville Island and I decided on silk blends because they're protein-based and will pick up dye colours more vividly than a cotton thread. I also have lots of cotton muslin, some wool jersey, vintage linen, and a handful of cotton baby onesies. 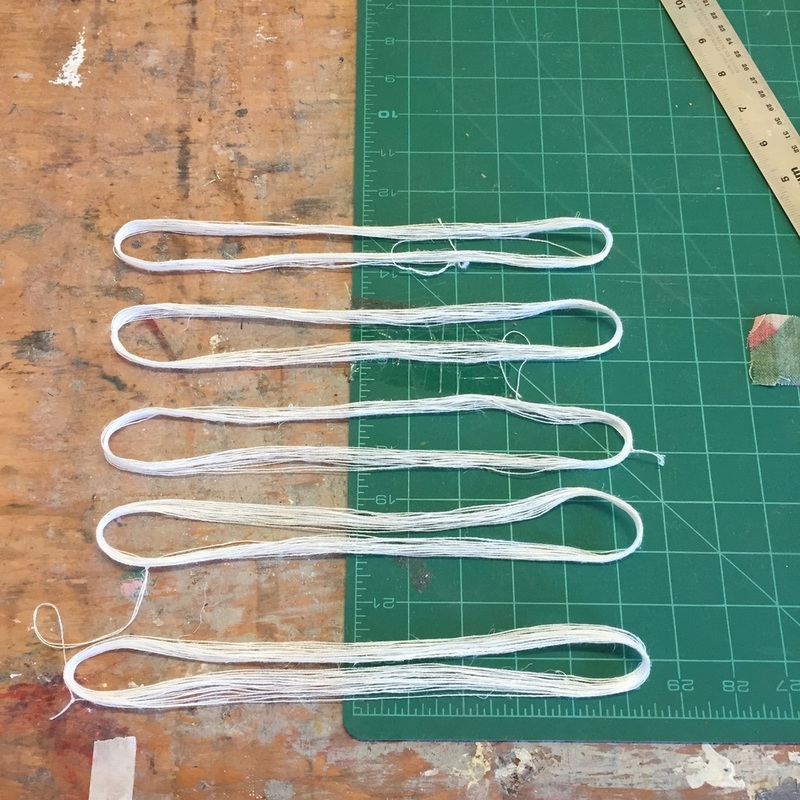 Dividing the silk thread into smaller bunches. A post-dye bath of iron can also be used alter the dye colour to shift the colour into grey. Once I've done all the dyeing, I can decide whether things need to be over-dyed (put in another dye pot to change the colour) or dipped into an iron bath. I've been focussing on dye stuff and mordants that can be safely discarded of. This means that I'm avoiding using a mordants like tin or copper. I'm also aware that iron is difficult to dispose of, so I will likely bring home the iron bath that I make so I can dispose of it properly. 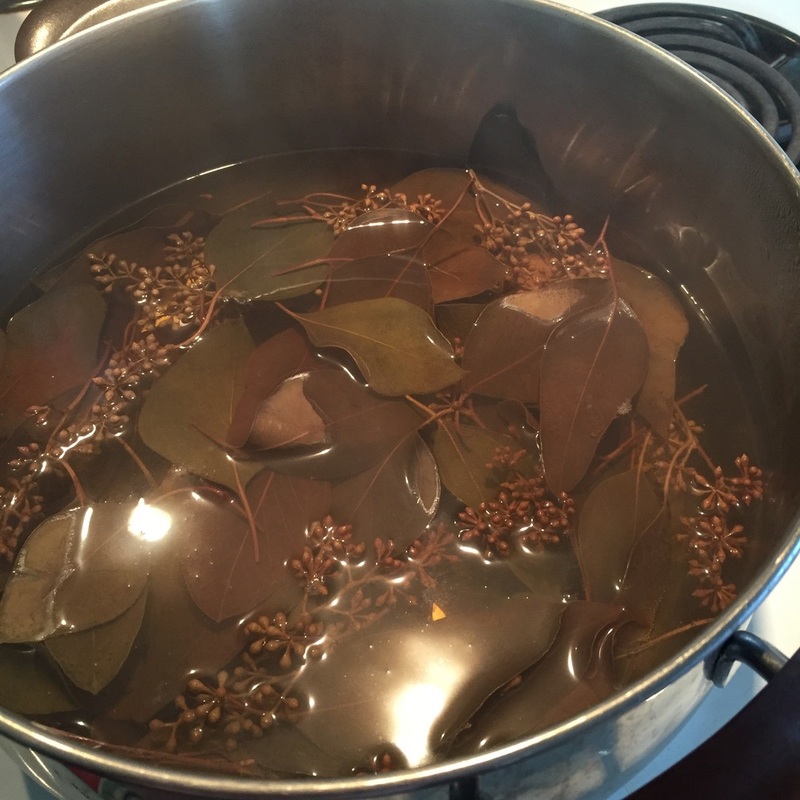 Eucalyptus in the dye pot. These were from our wedding but I've been hanging onto them to make dye. Not local, but a good way to reuse expired flower arrangements! Left to right: Horsetail, carnation flowers, and foxglove flowers.